J. Wilhelm Roofing has been professionaly servicing the roofing needs of South Jersey customers since the mid-1920's. Our scope of expertise is constantly expanding in order to keep up with the latest in roofing system technologies. We handle all aspects of Commercial Roof Restoration including New Installation, Inspection, Restoration, Repair or Replacement, Solar and offer a Pro-Active Roof Maintenance Program. Single ply roofing systems deliver high performance in both new and re-covered applications. We only use the finest materials with precise craftmanship with all of our projects! 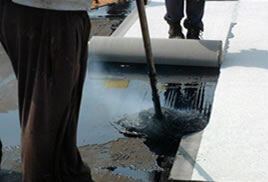 The staple of flat roofing systems for over 30 years, our certified technicians are well trained within the modified bitumen applications with accute attention to details. Metal roofing systems offers unmatched durability lasting 2 to 3 times longer than most roof finishes. In addition, most metal roofs are made from 30-60% recycled materials! 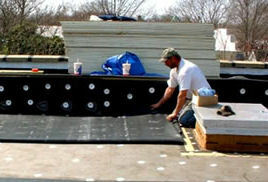 J. Wilhelm Roofing can also assemble and install new solar racking systems and arrays. We have worked with many of today's current leading solar companies including SunPower, WoldWater Solar, Pro-Tech Energy, NFI Solar, Tioga Energy and Constellation Energy to name a few. 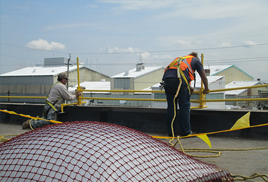 Our goal is to consistently provide cost-efficient, top-quality workmanship for all our Commercial Roofing clientele. If you would like to request an inspection or a bid please use our easy free quote page or e-mail us at office@wilhelmroofing.com.